Shamrock ties offer the luck of the Irish and some feature Guinness branding or four leaf clovers! 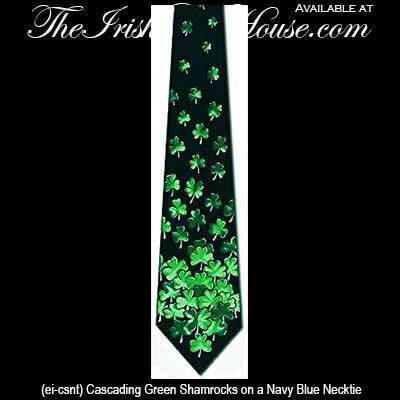 These Irish neckties are great for weddings and parties along with St. Patrick's Day and yes, sadly, funerals. Sadly, it is often for funerals that we see our greatest demand for our shamrock ties and when this is the case a quantity of Irish neckties may be needed quickly. At The Irish Gift House we endeavor to act accordingly to your needs and while our typical delivery is in 2 - 3 days, we are happy to arrange express shipping of our Irish ties if required. Please contact us for details. Irish tie features a green design with white shamrocks in an optic motif. Irish tie features a blue design with green shamrocks in an optic motif. Irish tie is a green and navy blue striped design that features green shamrocks. Irish tie features scattered green shamrocks in a navy blue field. Irish tie is a green design with scattered blue shamrocks. Irish tie features cascading green shamrocks along with lucky four leaf clovers on a navy blue field. Irish tie features cascading green shamrocks along with lucky four leaf clovers on a black field. 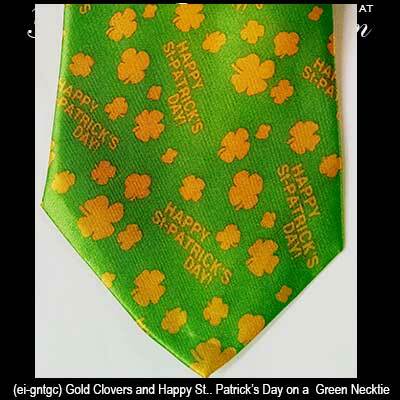 Irish tie features a design that includes four leaf clovers along with coins and lottery tickets. Guinness tie features green shamrocks that are enhanced with pints along with the words luck and sláinte. Guinness tie features cream accented pints of your favorite Irish stout in a black field. Shamrock tie features a lime green motif on a purple field. Irish tie features lime green shamrocks on a black field. Irish tie features a fun St. Patrick's Day design that includes four leaf clovers. Irish bow tie features a light up shamrock in the center along with green on green shamrock fabric. You'll be a proud Irishman wearing a shamrock tie to any function. The Irish Gift House also has additional accessories such as Celtic tie tacks and Irish and Celtic cuff links that you may add to your attire. The well dressed Irishman may also wish to add a Claddagh ring or a silver Celtic band; that way everyone will be able to identify your proud heritage. Another thought for additional masculine jewelry is to browse our assortment of men's silver Celtic crosses or our gold Celtic crosses.